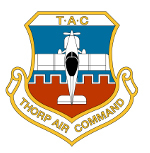 The Thorp is stressed for aerobatics (+9/-6 G’s at 1250 for the standard wing and 1500 lbs for the “C” wing). How is "stressed for" defined in this statement? Some makers quote the nominal stress to break the wing, with no factor of safety. Others give the working stress, which includes the FAA's recommended factor of safety. A "6 g" wing at Zenith is a "4 g" wing at Van's, as I read it. How is the "+9/-6 G" defined for the Thorp? I think Thorp wrote he designed the plane for the nominal FAA aerobatic rating of 6 G, which would entail calculating for 9 G, but I didn't write down where I (thought I) read this. If it's stressed for Acrobatic at 1250, then 1650 gross would correspond to a Utility loading. The second case. The T is stressed for +6/-3 at 1250 with no deformation. The ultimate load, I believe is 9. The S is stressed for +6/-3 to 1500lbs. This brings up a second question: Does the S-18 wing have a beefier spar, or did the details of the folding wing make for a stronger joint at the "break" for the dihedral? Which brings to mind a third question: How is the break joined in the T-18? On the S-18 it's surely steel plates and pins. Is the T-18 simply riveted aluminum, then? Yes the S is obviously stronger. That is mainly due to steel wing attach fittings in place of aluminum ones on the T. There are also other, more robust fittings in the wings of the S. The S has a slightly different spar as well. The T wings are joined via pins or bolts. The T wings are joined via pins or bolts. Can the outer panels be removed on a T-18? I assumed the T-18 wing was a big, one piece assembly. The outer wings on both can be removed. It's just a matter of how long it would take and how hard it would be. The S were designed to be removed easily. removing the outer panels on the T18 aren't that big of a deal, and the bolts are easily accessible. It would take 2 people to hold te outer wing as the other loosened the bolts. There are also other, more robust fittings in the wings of the S. The S has a slightly different spar as well. At risk of becoming a pest, I'll admit to being curious about those other differences. Are the more robust fittings at the joint to the fuselage? Are the spar differences in the caps, the web stiffeners, or elsewhere? The bending moment at the joint between inner & outer panels is obviously greater on the S, hence the main spar steel fittings. The spar caps are also heavier on the outer panels only - same reason. Some vertical web stiffeners were added, and many of us added those to our T spars also. Other than that, the center spar is just a cut-down version of the original design. The fuselage attach fittings remain the same. Some vertical web stiffeners were added, and many of us added those to our T spars also. Were the stiffeners added to bring the web up to the strength of the new dihedral break, or were there some T-18 wings in service showing a need for more stiffness to the web? The standard T wing is just fine as is. Some have felt the need to beef up the spar, not a bad idea but not required. There are 100s of Thorps flying today without the stiffeners. All are 100% safe and rock solid. I agree with Lee that there is no need to have the stiffeners. If you research the old newsletters, I believe Lou Sunderland said as much. I also believe that the stiffeners were added by Lou due to an incident where a T-18 was drastically over-stressed and some wrinkling of the spar web occurred. If I'm not incorrect, I think that the airplane was subjected to something greater than 10 positive G's. That airplane is in a hangar here in Denver. Lou thought that it was a simple way to add a small amount of additional strength with no downside. I'm not sure if John T. concurred or not. When I built my T18C 30 years ago I asked these questions of Lu and was told to treat the C wing limitations the same as the standard T18 ie +6 -4g @ 1250lb 9g ultimate. Unless the S18 wing is structurally different/beefed up I can not see how it can be legally aerobated at above 1250 lb. Perhaps the design engineer who did the calcs for the S18 wing could speak up rather than leave us all guessing?